Only 2 LT Leather models left in stock! 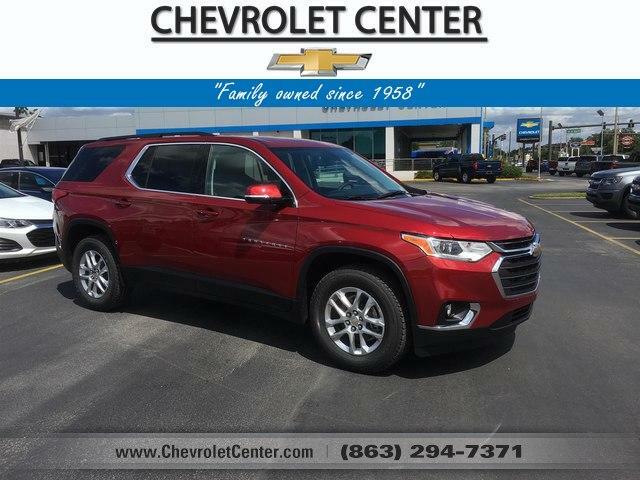 3rd Row Seat, Heated Leather Seats, Power Liftgate, Rear Air, Back-Up Camera, ENGINE, 3.6L V6, SIDI, VVT, TRANSMISSION, 9-SPEED AUTOMATIC, LT LEATHER PREFERRED EQUIPMENT GROUP, AUDIO SYSTEM, CHEVROLET INFOTAINMENT. Tow Hitch. TRAILERING EQUIPMENT includes (V08) heavy-duty cooling system and trailer hitch, LPO, FLOOR LINER PACKAGE includes (RIA) front and second row all-weather floor liner, LPO and (RIB) third row all-weather floor liner, LPO and (CAV) integrated cargo liner, LPO, LT LEATHER PREFERRED EQUIPMENT GROUP Includes Standard Equipment, 9-SPEED AUTOMATIC (STD), CHEVROLET INFOTAINMENT SYSTEM with 8 diagonal color touch-screen and AM/FM stereo, includes Bluetooth streaming audio for music and most phones; featuring Android Auto and Apple CarPlay capability for compatible phones (STD), VVT (310 hp [232.0 kW] @ 6800 rpm, 266 lb-ft of torque [361 N-m] @ 2800 rpm) (STD). newCarTestDrive.com's review says Smart controls and a wide console should impress the driver, and everybody might admire the soft-touch surfaces and durable plastic materials..